Mike Ritter, Art Director for the GA Voice, died on Sunday, March 30, 2014. He was 48 years old. The cause was complications after surgery to correct dissection of the aorta. Friends and colleagues of the former American Association of Editorial Cartoonists President are shocked at this sudden loss. The GA Voice has the details here. Veteran cartoonist Hal Sherman (1911- ?) worked at DC Comics in the 1940s. He helped create the Star Spangled Kid with Joe Shuster. He served three years in the service (1943-46). When he returned, he went back to DC and assisted Bernard Baily on The Spectre. He also created some stand-alone humorous pages for DC, which he signed. Most of these were titled "Silly Situations." During this time, he was also a gag cartoonist. That's about it. That's why there's a "?" for the year of his death. I've looked on the web for more information on the man and the panel, but there's little else. THE LITTLE FRIAR is listed in the Catalog of Copyright Entries. Third Series: 1961: July-December by the Library of Congress Copyright Office as copyright Hal Sherman. THE LITTLE FRIAR by Hal Sherman, "suggested by Percy Barker," is copyright 1961 by Mssrs. Sherman and Baker. This book collection is from the same year, published by Avon. THE LITTLE FRIAR tends to be wordless. The Friar himself does not say a word, but merely looks on, amused, with those big manga-style peepers. 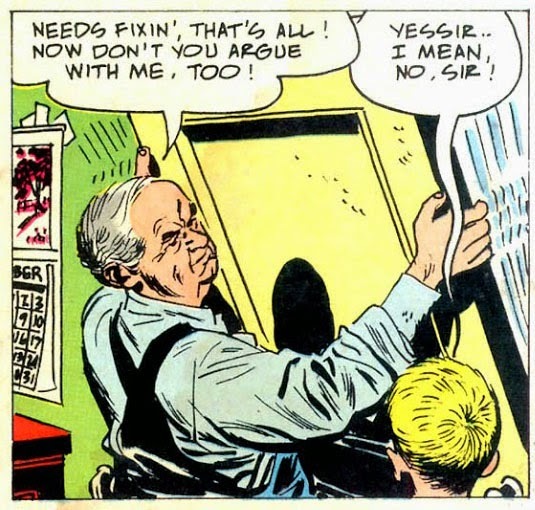 An actual gag line (the words below the panel) is rare. More often there's a sign or a label, if there's any text at all. I bought this book on the strength of the first two gags below, which I thought were fun and well-done. But some of the gags (the watery angel, the bird bath one) confounded me. Actually, being a secretary would be going to pink collar from blue collar. A step up from Laverne and Shirley's jobs at the Schotz Brewery, yes? So maybe it's not so questionable for its time. Long before Fantasia, alligators danced. In 1912, Heinrich Kley (1863-1945) drew "The Dancing School," a series of comic panels for Simplicissimus, a weekly newspaper. 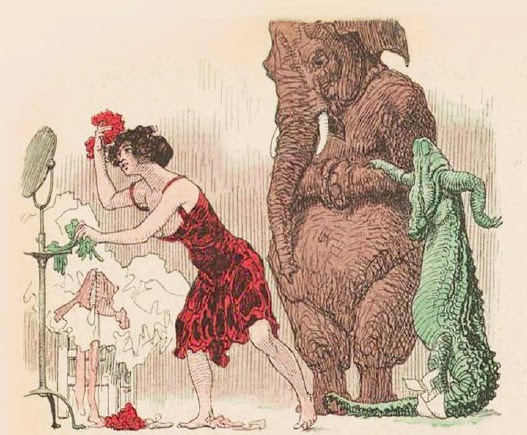 Regardless of your proficiency with German, you can still look at these stunning pen and ink drawings of an alligator and an elephant learning to dance. We had a couple of oversized books of Kley drawings when I was a kid. They were wonderful things to look at. The guy had chops. He knew the anatomy so well that he could, very convincingly, depict these animals participating in incongruous endeavors. Get over to the Yesterday's Paper's blog for a complete look at these pages. Norman Thelwell (1923-2004) was a very popular cartoonist known for his PUNCH cartoons -- especially his horse-related drawings. 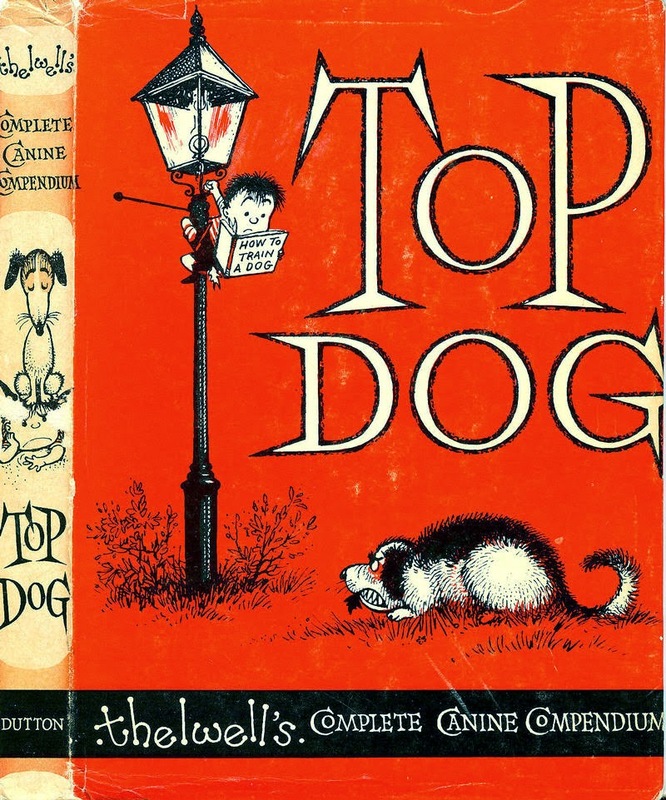 His inky style appeared in many magazines and he appeared in 32 books which sold over 2 million copies in the UK. You can see why he was very popular by getting yourself over to The Hairy Green Eyeball II blog, which has scans from his book TOP DOG. Here's a mystery: a one page comic titled "Randy," which looks to be from the Ketcham studio. It appeared in a 1970 issue of the Catholic-themed comic book TREASURE CHEST. 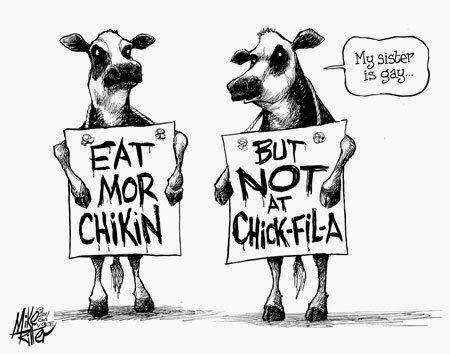 Who exactly drew this and why, I don't know. The gag is pretty generic. I know that "Randy" was an occasional series that appeared in TREASURE CHEST. I don't know if it ever graduated from one-pager fillers to whole stories. Looks like George Pflaum, who created the comic book, hired some of Ketcham's stable of artists to create this content. Ketcham had a good number who were busy with the extensive DENNIS THE MENACE comic books. A few pages for TREASURE CHEST must have been added to their load. At least, that's my guess. 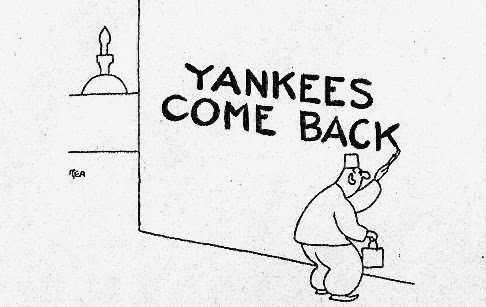 From March 12, 2014: New Yorker cartoonist Joe Dator shows his rejected New Yorker cartoons at the Judson Memorial Church, New York City. You know, when all of these magazines and pamphlets slap photos on their covers, they all look alike. 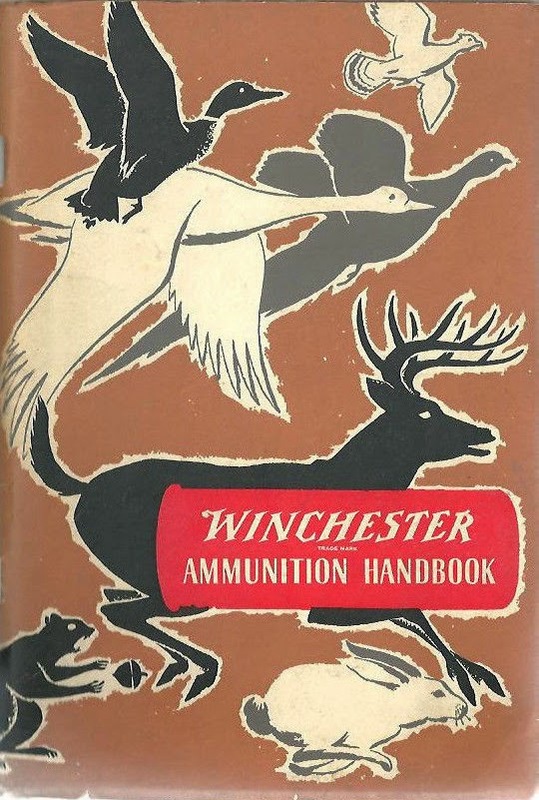 Here's a gun manual from 1951 that is so striking in its use of illustration that you just look at it for a few extra seconds, taking it in. It's a thing of beauty, isn't it? Wish more publications today would use real drawn imagery by real people. 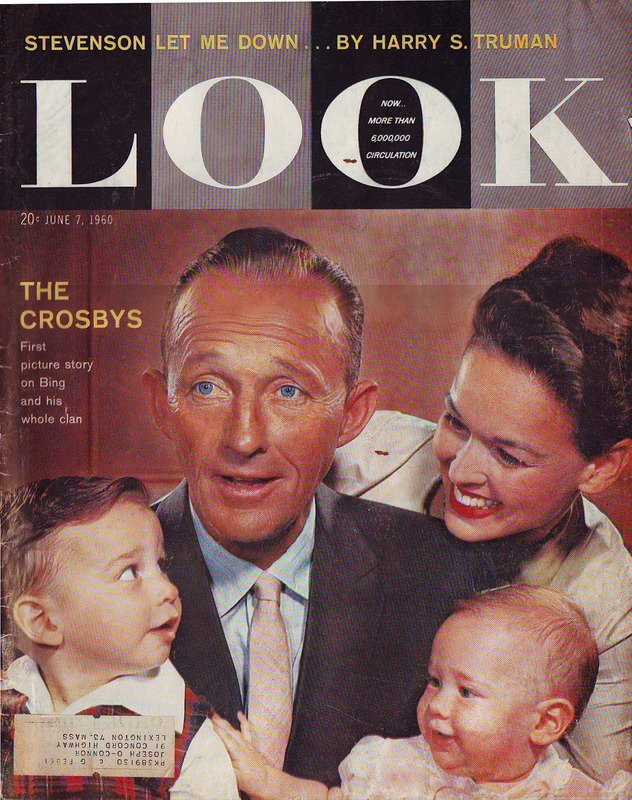 Old Blue Eyes, and his new family, graces the cover of LOOK Magazine for June 7, 1960. And truman writes a blistering article about Adlai Stevenson. The magazine, "Now More Than 6,000,000 Circulation," would peak at 7.75 million copies nine years later. But by 1971, the oversized (11" x 14") magazine ceased due to declining ad revenue. The one and only Gurney Williams was the cartoon editor of the magazine at this time. Before that, he had done the same job for Collier's Magazine, Woman's Home Companion and American Magazine. My thanks to John Klossner for the loan of the magazine. Thanks, John! 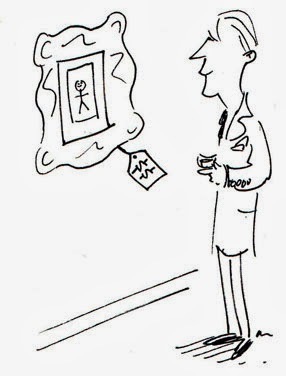 Mr. Media talks to TOO MUCH COFFEE MAN cartoonist (and New Yorker cartoonist) Shannon Wheeler. This interview lasts about an hour. Here's New Yorker magazine cartoonist Harry Bliss commenting on Sunday's 60 Minutes piece about New Yorker cartoonists. From a March CAPS get together, here are Frederick Schroeder and Dave Kellett talking about their new documentary about comic strips in the 21st century: STRIPPED. 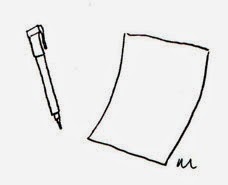 60 MINUTES: "So you want to see your cartoon In The New Yorker?" 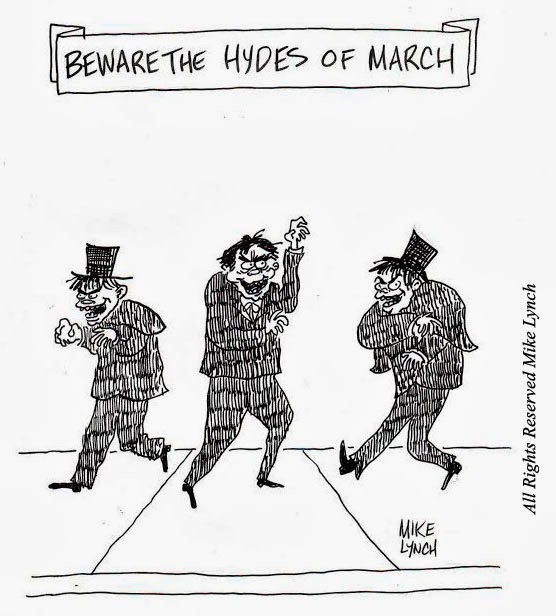 From the March 23, 2014 CBS 60 MINUTES show: New Yorker cartoon editor Bob Mankoff lets 60 Minutes cameras into the weekly process of picking the magazine’s famous cartoons. Morley Safer reports, David Browning and Jonathan Schienberg produce. 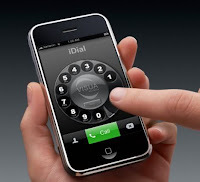 "If the dial isn't on your phone, it soon will be." "Now You Can Dial" is a 1954 short hosted by Susann Shaw and directed by Charles E. Skinner. LITTLE NEMO by Winsor McCay has been in the public domain for a while, and now Locust Mook will publish LITTLE NEMO: DREAM ANOTHER DREAM, a new book celebrating the seminal comic strip, with new NEMO comics from contemporary cartoonists. It's going to be a big book (16" x 21"), with a simultaneous Fall 2014 publication in two editions: a hardcover and a newspaper (!) edition. 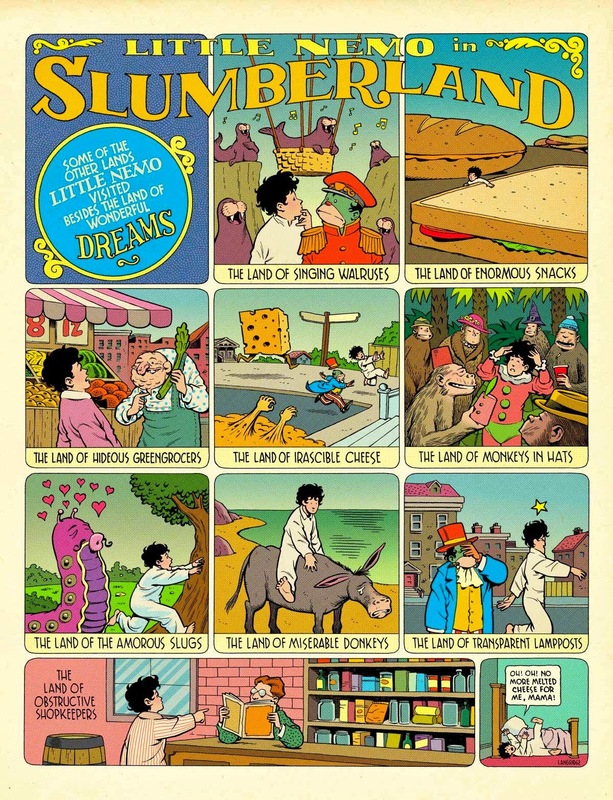 In Locust Moon Press’ upcoming anthology LITTLE NEMO: DREAM ANOTHER DREAM, many of the world’s finest cartoonists will pay tribute to the master and his masterpiece by creating new Little Nemo strips, following their own voices down paths lit by McCay. Contributors include Paul Pope, JH Williams III, Bill Sienkiewicz, David Mack, Carla Speed McNeil, Charles Vess, Peter Bagge, Dean Haspiel, Farel Dalrymple, Marc Hempel, Brandon Graham, P. Craig Russell, Jeremy Bastian, Jim Rugg, Ron Wimberly, Scott Morse, David Petersen, J.G. Jones, Mike Allred, Dean Motter, Yuko Shimizu, Roger Langridge, and Mark Buckingham, among many others. Hat tip to Heidi MacDonald! 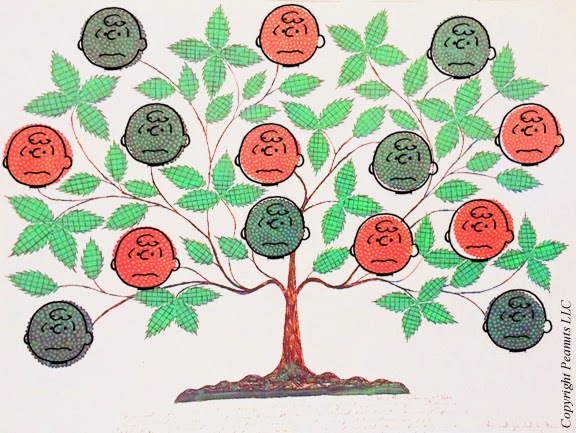 The "Tree Of Life", 1854, Hancock Shaker Village, Pittsfield, Massachusetts -- with Charlie Brown heads. Everything looks better with Charlie Brown heads. 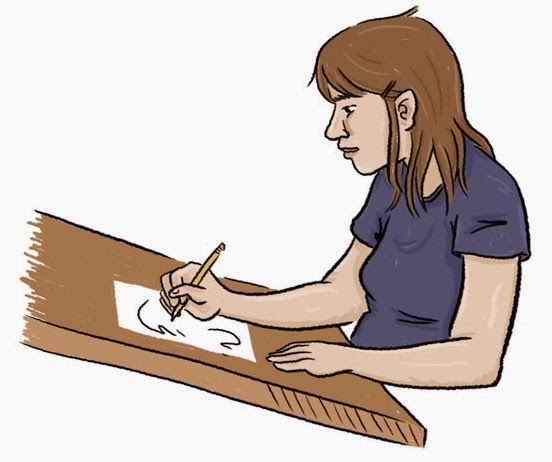 Susie Cagle: "Eight Years of Solitude"
People might want to use the word "sobering" to describe Susie Cagle's "Eight Years of Solitude" article for the Medium site. It's a reflection on her eight years as a cartoonist journalist. I think the right word is "honest." If you go so far as using two words, "very honest" would do it. She is a successful freelance writer and cartoonist whose clients include McSweeney's The Huffington Post, The Atlantic and more. "The year I got the most TV and radio spots and magazine write-ups, I made about $17,000." "I was arrested and jailed while reporting on Occupy in Oakland because the police didn’t recognize the outlets for which I freelanced. Some media blogs speculated that it was because I was really a cartoonist and not a reporter at all. When I reached out to Columbia for guidance on facing the resulting criminal charges, the dean wrote a Tumblr post about it." The Sequential Crush blog will cause you to stop and wander through many of its 1960s and 70s romance comic book stories. It's all here: the longing, the wondering why, the kissing, the crying -- but most of all: the mod, mod fashions. 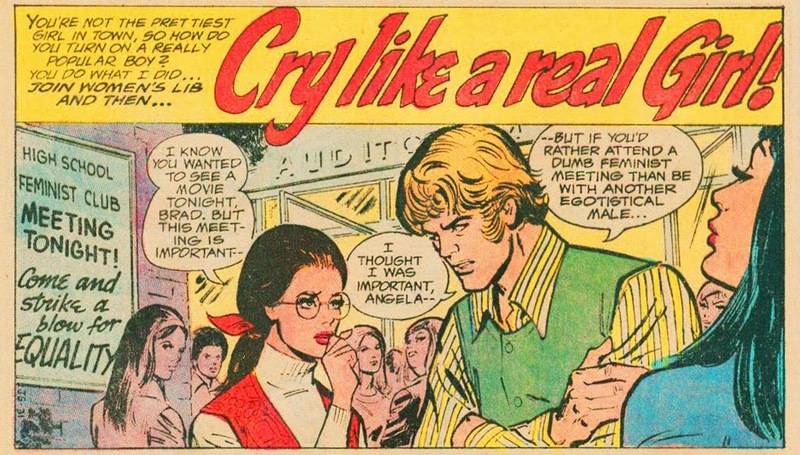 Here's the latest: "Cry Like a Real Girl!" from DC Comics' Young Love #108 (Feb/Mar '74). 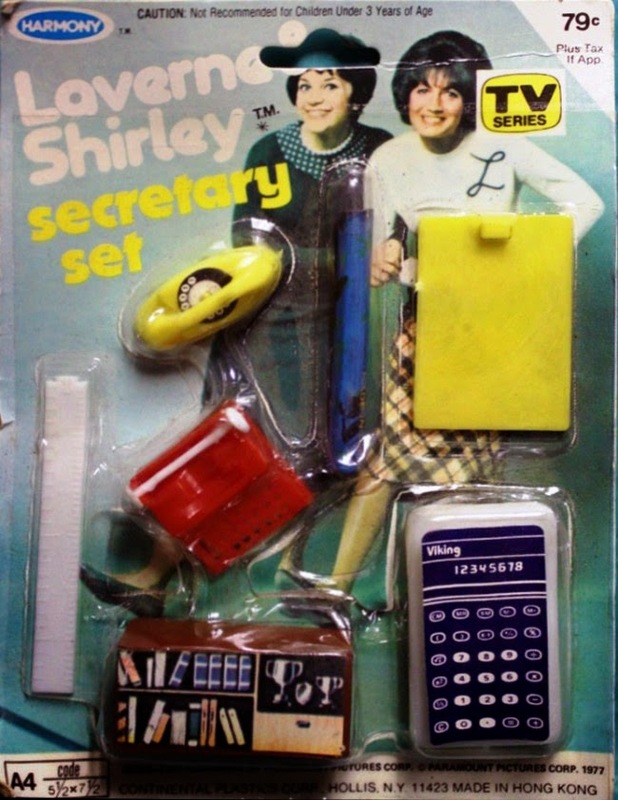 The pencils are by Win Mortimer. Sometimes, even New Yorker editor David Remnick doesn't "get" a New Yorker cartoon. The New Yorker editor David Remnick admits even he doesn't always get the joke in the magazine's cartoons. Morley Safer reports on the cartoon selection process -- including an interview with cartoon editor Bob Mankoff -- on Sunday, March 23 at 7 p.m. ET/PT. Upon the occasion of their gallery shows at the Billy Ireland Cartoon Library and Museum (the free and open to the public reception is tomorrow, by the way), two of the best cartoonists -- Bill Watterson and Richard Thompson -- talk to curator Jenny Robb and Exhibition Curator Caitlin McGurk. "Most often I’d begin with the words. Generally, the writing underwent so many revisions that there was no point in drawing anything until the dialog was fully set. I could always visualize the pictures anyway. It was the writing that gave me fits." "It was frighteningly easy. The characters came alive and I lost control of them early on. It was like dictation. The plots were so tenuous it didn’t matter what direction they went in. I always thought of it as an organic process. I’d just stand back and let it grow." 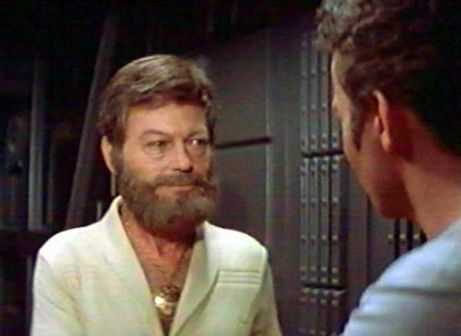 "You know engineers -- they LOVE to change things," grumbled Dr. McCoy in STAR TREK THE MOTION PICTURE (1979). Back before I was a cartoonist, when I used to work full-time in an office, I worked with a guy who did good work ... up until the time the software got upgraded. Of course, we had classes where we all learned the new software. It's a pain -- but, look, change is part of life. But my friend did not face up. Riding that learning curve was not for him. He got mad, and hated the new system. He had reached his level of technological aptitude. And he was going to stay stuck in an old school Windows 98 world because that's what he knew. So there. But, thanks to the Internet, I see there are legions that have reached that breaking point. I keep seeing these retro takes on new gadgets. Some are for fun and some are for real. Hmm. I think that last one is real. Maybe, maybe not. 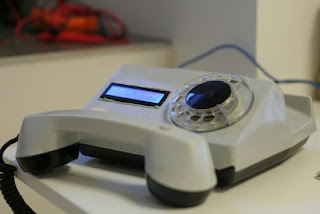 Now there this Don Draper-era "Tweephone," where you have to dial the phone many, many times to make a letter. Created by a pair of Ukrainian tech companies, the Tweephone makes you enter your tweets one character at a time using the rotary phone dial. Of course with lots more letters in the alphabet than numbers on the dial, some letters require two or three turns to complete. That means completing a 140 character tweet could take some time, but hey, the world operated at a slower pace back then. Typewriters? Are they still around? 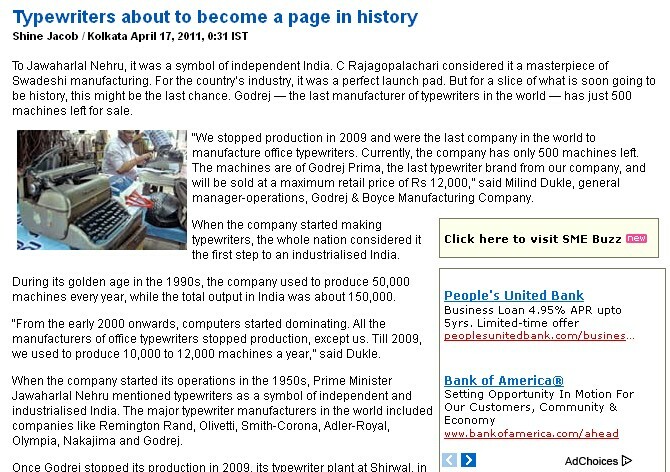 Business Standard has stated they are going the way of the dodo. Edward Michael, General Sales Manager at the typewriter company Swintec read that erroneous report on the last typewriter company in the world closing and "thought it was a typo." 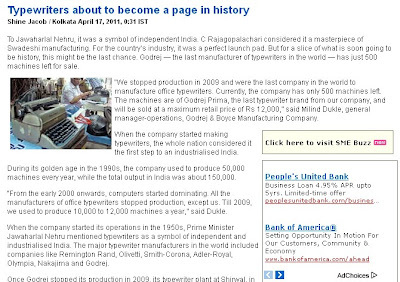 "We are a typewriter company, and we are alive and doing very well." 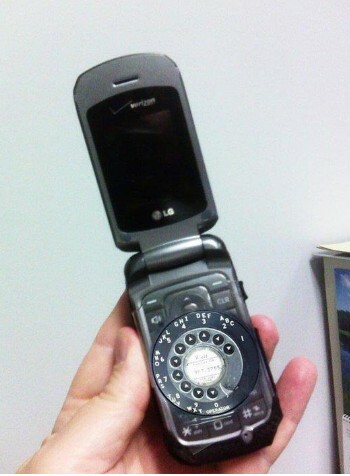 So, even though engineers love to change things, you can still hang onto to a little bit of retro. 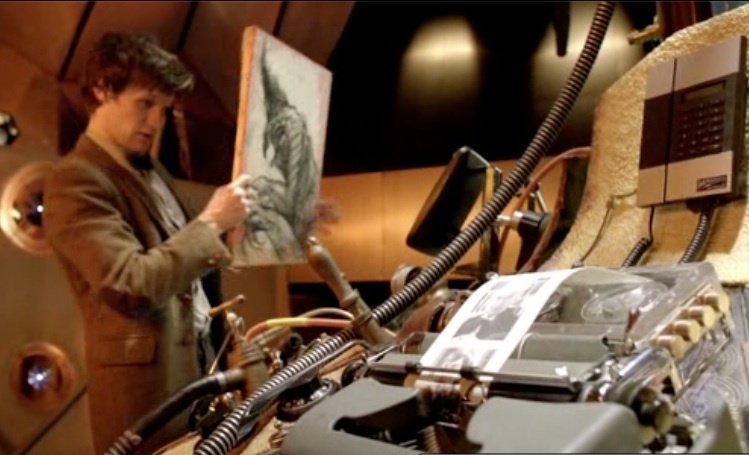 Above: the manual typewriter that's part of the control console on DOCTOR WHO's Tardis. Hat tip to Mark Anderson! -- Edited from a November 3, 2011 blog entry. Gag Cartooning Questions "What Equipment is Essential?" "Where to begin? I wish to eventually submit b&w single panel gags about babies or parenting humour to appropriate publications. What equipment is essential for this? I.e. software? I have very little graphic design/sofware editing skills as all my pictures have always been gags or caricatures by freehand. Bear in mind if it absolutely a requirement to use software, pricing is an issue (tight budget). Any recommendations would be appreciated :)"
Cartooning is still very inexpensive. But you can get trapped into thinking you need to have $1000s to start. Not true. I am not affiliated with a company, like Apple or HP. I am a regular person who has tried different things (drawing on paper, drawing with a Wacom tablet, using a PC, using a Mac) and here's what's worked for me. The way that your communicate with your public, and your clients, is through the Web. So, obviously, having a computer is essential. I use a laptop, one that I can take with me if needed. You can find inexpensive, used laptops from a local computer repair shop. If they are reputable, they'll offer a warrantee. This year alone, I will be away from my studio about a half dozen times teaching cartoon classes for a day or a week in New York, Maine and Iowa. By taking my laptop, I'm able to take my office with me. Ditto for my cell, which is also my studio number. Pen and paper. I use Micron Pigma pens and higher grade copy paper (28 lb (104 g/m2) laser printer paper, bright white). I have some other kinds of paper for other kinds of projects too, but the laser printer paper is the kind I use when drawing a black and white gag cartoon. I bought a scanner to scan the cartoons into my computer. Scanners come with programs that duplicate aspects of Photoshop. So, you can scan a cartoon, save it, and then toggle its brightness, contrast, hue, etc. By drawing on paper, you then have an original that you can then have for a gallery show and sell to a client who collects originals. 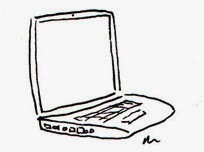 CON: the cost of the tablet and program -- and the temptation to endlessly tweak the drawing. ANOTHER CON: the loss of ancillary income from selling originals (since an "original" no longer exists). Craveonline has a preview of a few of the special covers to DC Comics superhero line. 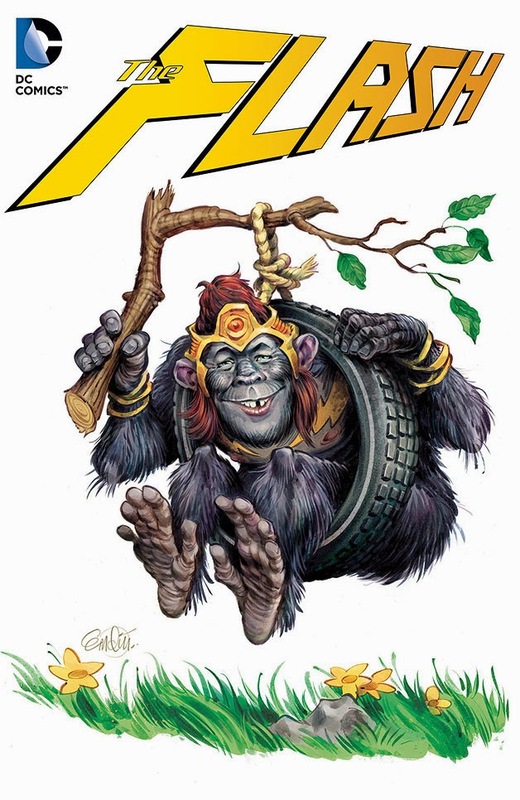 DC sent tone word out to MAD MAGAZINE that they would like some unique takes on their superhero line's covers. 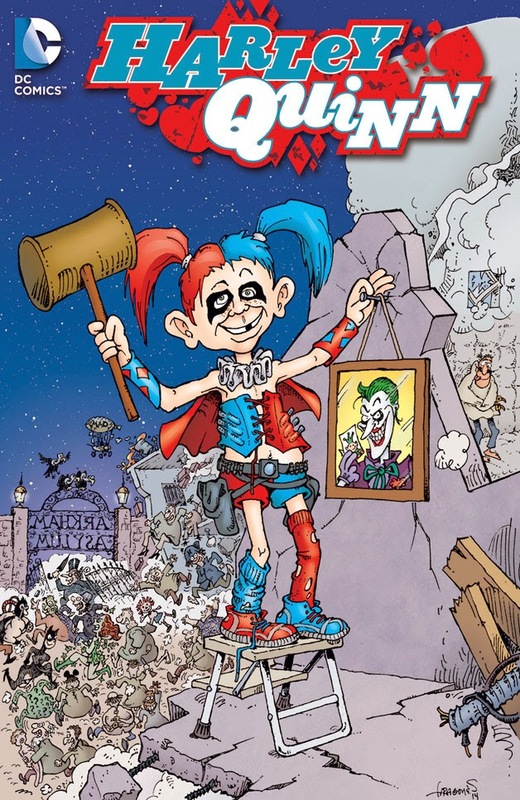 The results are great and funny, and include Sergio Aragones' HARLEY QUINN cover and Anton Emdin's FLASH cover. 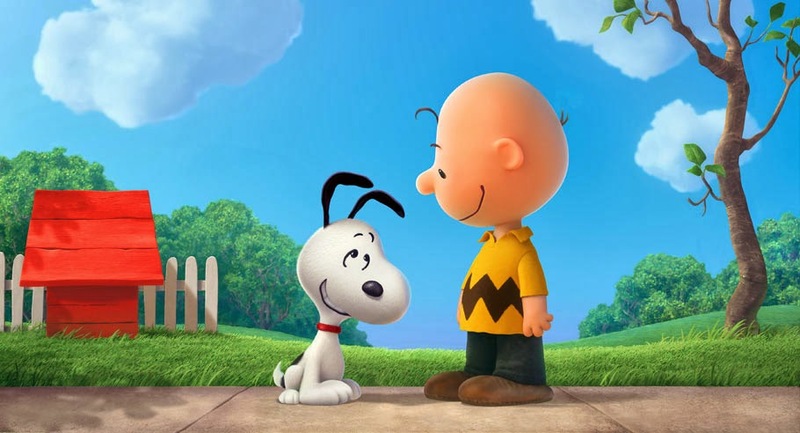 Cartoon Brew has a few pictures from the new PEANUTS movie. 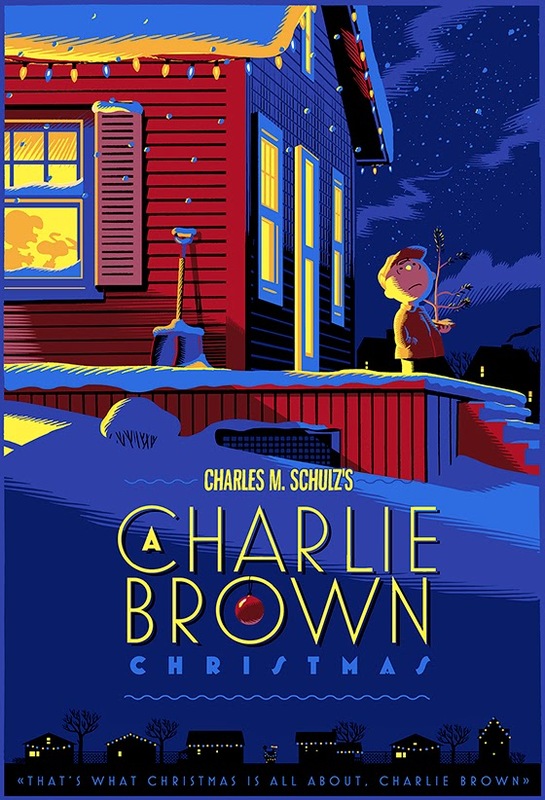 The movie is going to be a CGI-take on the PEANUTS gang, produced by Craig Schulz, Charles Schulz' son. Above is a sample image from Blue Sky Studios. the film is scheduled to open November 6, 2015. There should be a new teaser trailer later today. It's here. The movie is controversial, what with PEANUTS going off-model; away from its pen and ink comic strip model to a stylized 3D look. But it's not the first time that this has happened. 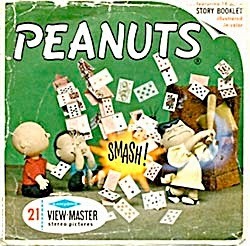 William Creswell has a Flickr account that showcases several PEANUTS Viewmaster reels from the 1970s here. 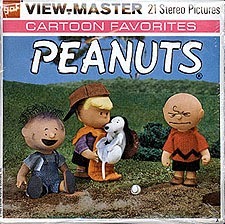 CollectPeanuts.com has many photos of the PEANUTS Viewmaster products here. John Barrett's Viewmaster Facebook group here. 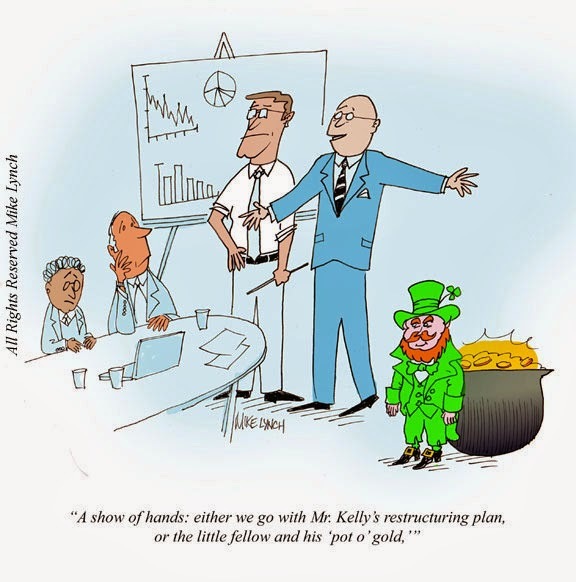 or the little fellow and his 'pot o' gold.'" 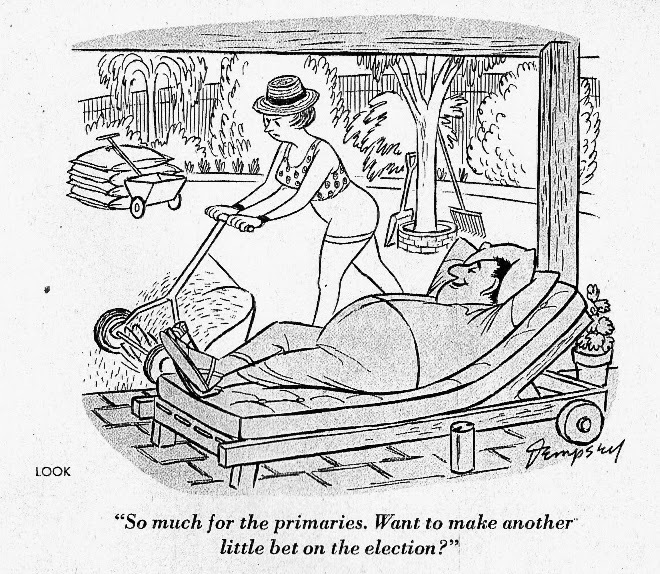 A cartoon of mine that originally appeared in Reader's Digest. The Saved From the Paper Drive blog remembers THE REAL McCOYS TV series (1957-63) and shows us some single stand-alone pages from the September 1960 REAL McCOYS Dell comic book with art by Alex Toth. French cartoonist Plantu talks about the Cartooning for Peace movement, which he created in 2006, and how cartoonists are barometers of freedom of expression. From Toon Buzz on Channel Frederator: Noelle Stevenson (AKA Gingerhaze), creator of the Web comic Nimona, Bravest Warriors and the upcoming comic book Lumberjanes (Comics Alliance preview here) talks to host Sapphire. Nimona is, in my opinion, one of the best drawn and colored stories on the Web. It's a bookmarked site for me. Ted Rall talks about NSA Web surveillance and its "Turbine" program, a close relative to "Prism," which targets Facebook users with malware. From a 1988 UWTV interview show "Upon Reflection With Host Al Page," here are David Horsey and Brian Bassett talking about the life of a Seattle editorial cartoonist. At the time, Mr Horsey, a two-time Pulitzer Prize winner, had been the editorial cartoonist for the Seattle Post-Intelligencer since 1979. He left for the Los Angeles Times in 2011. Brian Bassett worked for the Seattle Times for 16 years in the same capacity. He would leave in 1994. He is now the force behind two syndicated comic strips, Red and Rover (which won the National Cartoonists Society Best Comic Strip Award in 2013), and Adam@Home (which is now drawn by Rob Farrell). Movie trailer announcer Hal Douglas died at the age of 89. The cause was complications from pancreatic cancer. He died at his home in Lovettsville, VA.
Mr. Douglas was one of those voices that, if you went to the movies any time in the past number of decades, you immediately knew. Mr. Douglas was known for a generation in the voice-over industry as one of the top two or three go-to talents, along with Don LaFontaine, the most prolific, who died in 2008, and Don Morrow, the voice of the “Titanic”trailer. WHACK! #3 (1954) Edited by Norman Maurer and Joe Kubert. Sam Henderson has posted the contents of WHACK! here and here. 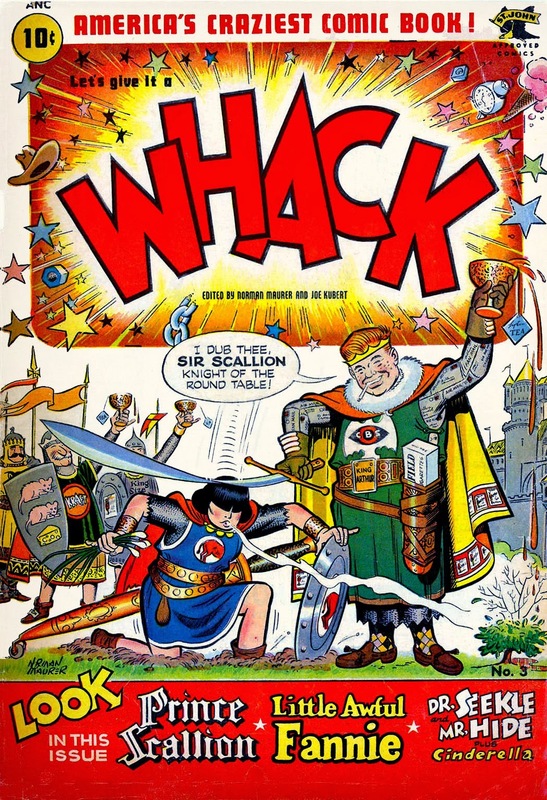 St. John Publishing's WHACK! is one of the many short-lived MAD MAGAZINE clones that tried and failed during the 1950s. It was co-edited by Norman Maurer and Joe Kubert, which is a darn good pedigree. Sam has been terrific about scanning many, many of the MAD-modeled comics and magazines through the years: CRAZY, SICK, ZANY, CRACKED, FRENZY, FLIP, foreign MAD editions and more. Well worth your browsing time. Thanks, Sam! 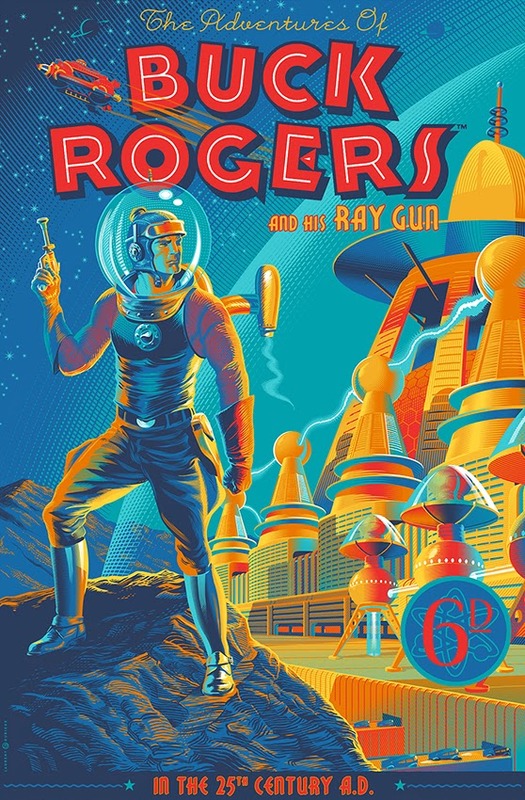 Stunning art by Laurent Durieux. Creig Flessel: "This Week In Astrology"